Following the announcements of Apple OS X Mavericks, a new MacBook Air line and the long awaited update to the Mac Pro, Apple's CEO Tim Cook unveiled the brand new iOS 7.0. The new version of the mobile operating system is described as "the biggest change to iOS since the introduction of iPhone," and introduces a new flattened interface with improved notifications, improved multitasking and all new apps. There have been complaints that Apple has not been innovative with their operating system over the last few years and it looks like the company has finally paid attention to these complaints. Apple iOS 7.0 is definitely adds a breath of fresh air to the again OS. The Control Center is one of the newest features of iOS and gives you quick access to the controls and apps you use the most. You can get access to the Control Center by swiping up from within any screen (including the lock screen) to get access to features like Airplane mode, Wi-Fi toggle or brightness settings. There is even a shortcut with access to using your LED flash as a flashlight, so you don't have to stumble through your apps looking for an app for that function. 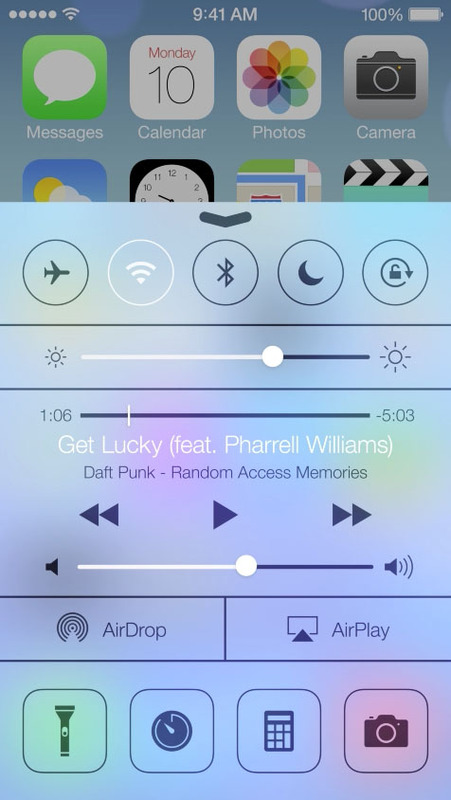 The Control Center lets you Turn on or off Airplane mode, Wi-Fi, Bluetooth, and Do Not Disturb. Lock your screen’s orientation or adjust its brightness. 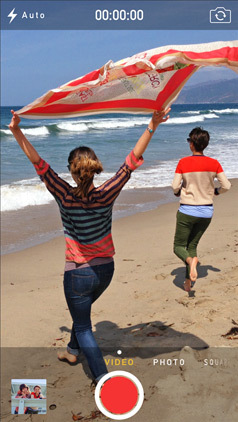 Play, pause, or skip a song. Connect to AirPlay-enabled devices. And quickly access your flashlight, timer, calculator, and camera. 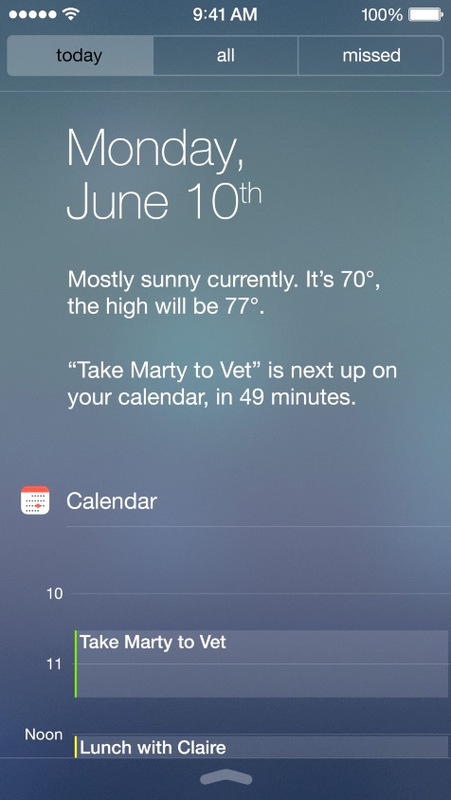 The Notification Center keeps you informed on your new email, missed calls, to-dos and more. The new Notification Center is divided into three categories - Today, All and Missed. Today gives you a summary of all your activities for the day, which can include birthday alerts, weather informations or traffic alerts. 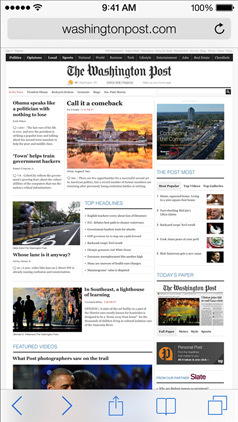 The Today section will even give you a peek into what you need to get ready for tomorrow. The 'All' section as you may expect is a collection of all notifications. Missed keeps a track of all the notifications you have missed ensuring that you don't forget anything that needs taken care of. Best of all all the notifications are now synced across all your devices. So when you take care of a notification on one device you don't have to address it on a different device. Up until now, multitasking on iOS has been nothing more than viewing and closing icons. However iOS 7 aims to fix this by introducing multi-tasking across all apps with background updates for the most frequently used apps. Best of all Apple says that the new multi-tasking is achieved without affecting battery life. You can get to the multi-tasking screen by pressing the Home button twice. You will see the running apps along with preview screens of each app. You can close an app by swiping its preview up and away from the screen. Apple also claims that iOS 7 will learn from your daily usage and update your most commonly used apps while reducing focus on apps you don't use often. Additionally iOS 7 will adapt to your surroundings and only find updates when you have a strong connection instead of straining when you are on a limited connection. 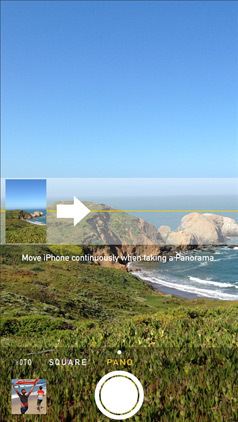 The updated camera app for iOS 7 makes it easy to navigate through all your photo formats - Still, Video, Panorama and Square. All you need to do is swipe between them and find a format that you want. Apple has followed the trend of apps like Instagram and offered instant filters on iOS 7 which can be applied to your still or square photos. You can apply filters immediately or at a later time. And if you decide you don't want the filter you can even remove it. 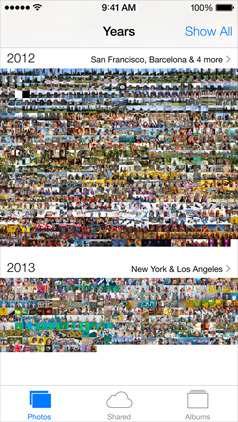 If you have a collection like "New Orleans", you can see photos from that trip organized into Moments according to date and location. When you tap the year view, your content is neatly displayed within years with locations you have visited showing up on the side. 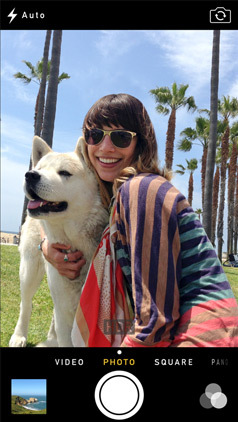 iCloud allows you to create shared photo streams with your favorite people. 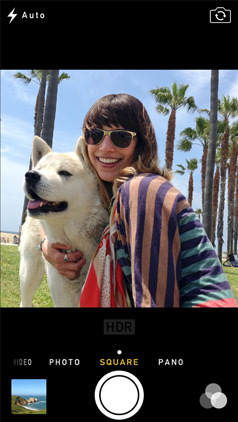 They can post photos, videos and comments to your stream which can be displayed on everyone's iOS device. 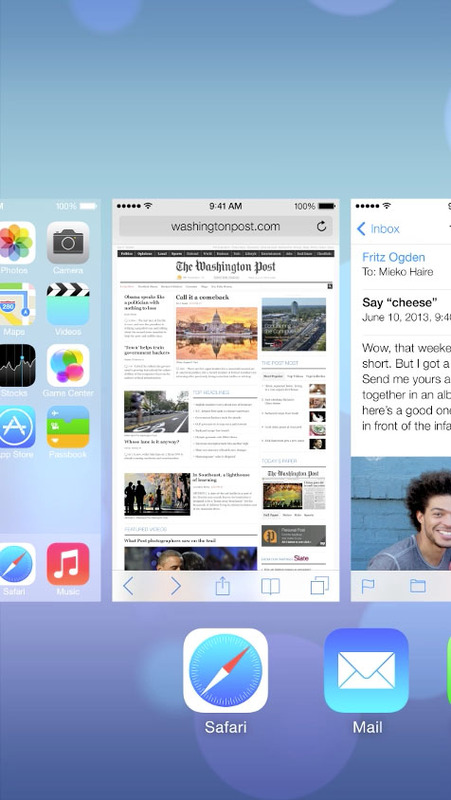 AirDrop was first introduced with OS X Lion and is now making its debut on iOS 7. 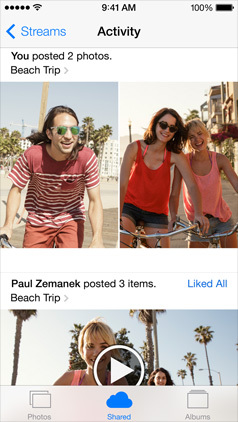 AirDrop for iOS lets you quickly and easily share photos, videos, contacts — and anything else from any app with a Share button. Just tap Share, then select the person you want to share with. AirDrop does the rest using Wi-Fi and Bluetooth. You are automatically visible to your contacts in AirDrop. But you can choose to make yourself visible to all iOS 7 users nearby or invisible to all. This can be fully managed from within Control Center. The content you receive (If accepted) is saved where it should be - For example a photo will be saved in Photos and so on. Apple may not be ready to use NFC just yet, but they made it a point to take a jab at their competitors pointing out that you don't have to tap your device with each friend you want to share your moment with. 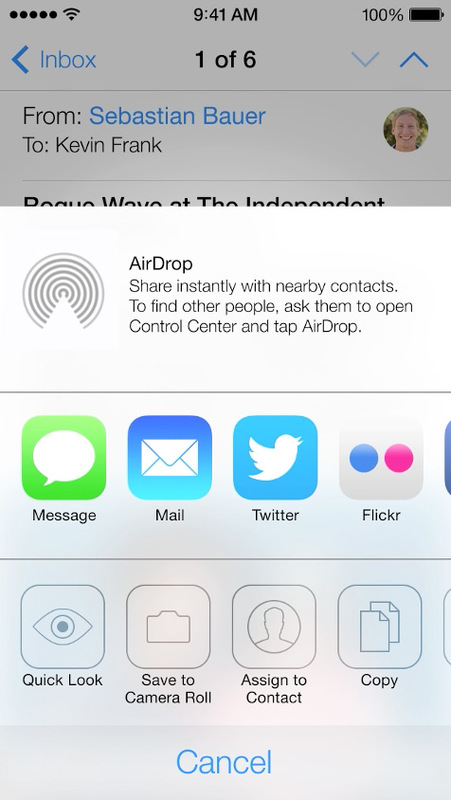 Airdrop lets you share with multiple friends with just one tap. 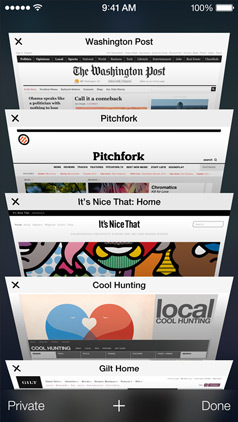 The Safari web browser has been greatly improved with iOS 7. You have a unified search bar which along with the buttons and paned will fade away when not in use, allowing the user to take full advantage of the large display. You can go back and forward on your page with swipes and the new tabs allows you to see your webpages in a neat consolidated view. You can easily move through or organize your tabs and closing it is as easy as swiping it off the screen, a feature Google Chrome users will be familiar with. Shared links allows you to see all the URLs in your Twitter timeline, who posted them and what they have to say. Reading Lists bring the same experience as OS X Mavericks by offering a seamless list of saved articles when you can easily scroll through from one to the next. iCloud Keychain and the Password Generator have also made their way to iOS 7 from OS X. iCloud Keychain stores all your passwords across your Mac and iOS devices with 256-bit AES encryption while Password Generator generates unique, hard to guess passwords which it remembers for you across all of your devices. Apple has now introduced iTunes Radio (previously rumored to be iRadio) as a part of the Music app on your iOS device. You have streaming radio stations made from Apple's vast selection of music. The more you listen, the more personalized it becomes. And it’s available on your iPhone, iPad, iPod touch, Mac, PC, and Apple TV for free. You can access featured stations based on 200 genres, personal selections or stations based on your own music collection. 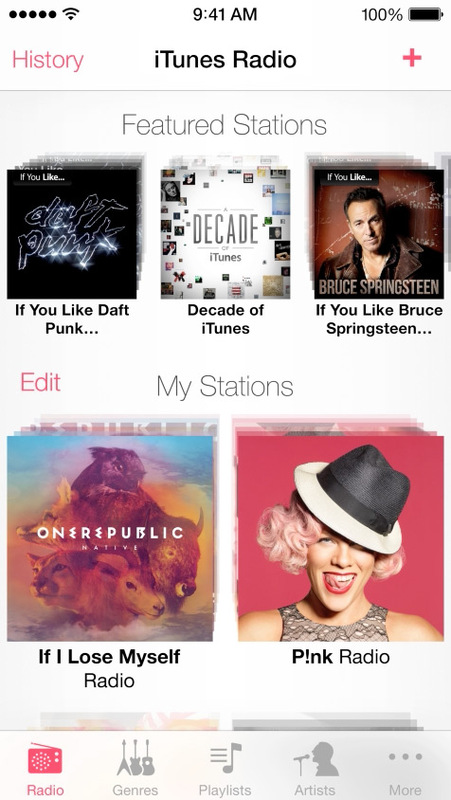 You can build new stations while you listen and discover new music based on your tastes. iTunes Radio will maintain a history of everything you have listened to or added to your wishlist, making it easy to download the music you want from iTunes. iTunes Radio will initially only be available to users in the U.S. but is expected to roll out to other regions at a later time. Apple's personal assistant is getting its biggest update since its release. While we were disappointed that Siri wasn't released for Mac OS X (Probably coming with OS 11) we found the new features most useful. Firstly you have a new look which fades into view. You can now choose between a male and female voice and the voice sounds more natural and easier to understand. Siri is faster at answering questions and checks sources like Bing, Wikipedia, and Twitter. Siri on iOS 7 is also capable of taking on tasks like returning calls, playing voicemail, controlling iTunes Radio, and more. Your content can now be viewed within Siri without having to open an application. For example if you do a web search your search results will appear on Siri instead of opening Safari. It looks like Apple has chosen to work with Bing for Siri search, which should be a big boost for Microsoft and a bomb for Google. It works the same way with Wikipedia and Twitter. The Apple App Store has some new features in iOS 7 like Apps Near Me, which shows you a collection of popular apps based on your location. 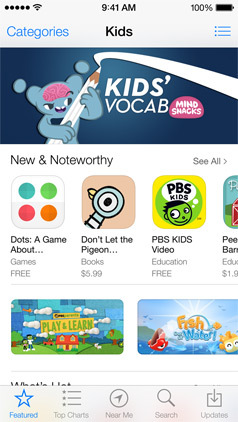 The App Store now also has a Kids category which shows apps for children based on age. The App Store for iOS much like the Mac App Store on OS X Mavericks keeps your apps up to date. 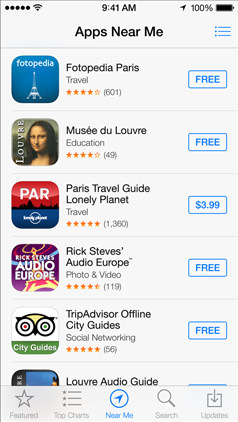 So you don't have to bother about red badges on your App Store anymore. However its not clear if Apple will give users the opportunity to disable this feature. Even though Find My iPhone can help you get your device back, but in the case that doesn't work out, iOS 7 has some new security features which can ensure that someone who doesn't own the device cannot find and sell it. 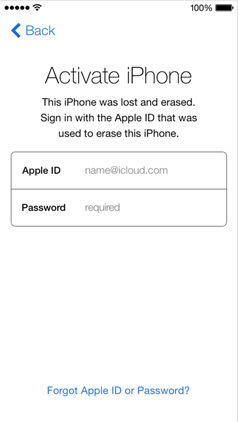 Now turning off Find My iPhone or erasing your device requires your Apple ID and password. 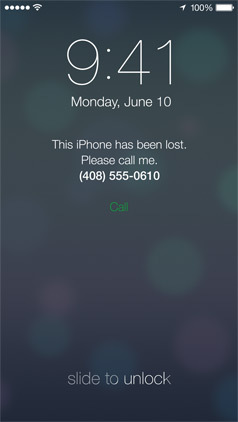 Find My iPhone can also continue to display a custom message, even after your device is erased but your Apple ID and password are required before anyone can reactivate it. So even if you lose your phone no one else can use it. iOS in the Care is an upcoming feature to iOS 7 which will be released at a later date. iOS in the Care gives us a glimpse of how Siri will change your driving experience, by allowing users to mirror an adapted version of iOS on your iPhone 5 onto their automobile’s in-built display. Users can respond to read-out messages using Eyes Free, as well as the ability to flip between different menus without having to look at the display and keep your eyes on the road. With iOS 7, users will be able to block unwanted correspondences on iMessage or FaceTime from individuals that you don't wish to converse with. Another great feature of iOS 7 is the ability to take FaceTime audio calls on your iOS device. While users may already have options like Skype and Viber to choose from, we expect that the public will warmly welcome and use FaceTime Audio when it is released with iOS 7. 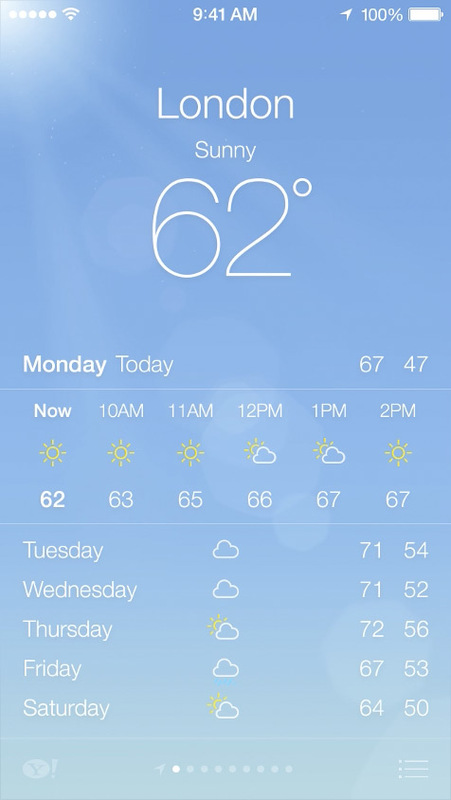 The Weather app is receiving a much needed update with iOS 7. The app is very visual and allows you to show weather in various locations in a very dynamic way. The new app looks somewhat similar to the new Yahoo! Weather for iOS. Along with the apps mentioned above, Apple has also updated all their core iOS 7 apps with their new flattened interface. 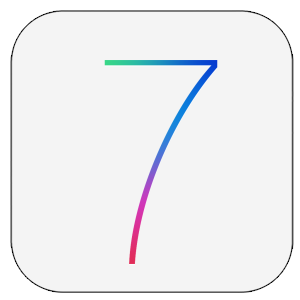 Apple iOS 7 is expected to be released this fall (possibly alongside a new iPhone) and the first beta is now available to developers registered in Apple's iOS Developer Program. Apple iOS 7 will be available for the iPhone 5, iPhone 4S, iPhone 4; iPad 4, iPad 3, iPad 2, iPad mini and the Apple iPod Touch 5. 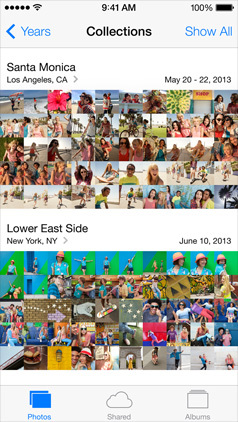 Are you excited about iOS 7? Share your thoughts with us in the following comments section.